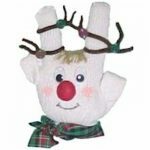 Kids all know about Santa’s reindeer and will have a great time making a Craftstick Reindeer Ornament for the Christmas tree. You can also use them to decorate packages and to give as presents to special family members. Using the picture as a reference, Glue 4 Jumbo craftsticks together and glue one of the regular craftstics diagonally across the back for support. Let dry. Put a small quantity of brown paint in a paper plate and paint your sled. Once paint is dry, glue on wiggle eyes and red bead for the nose. Draw on mouth with marker. Glue the two regular craftsticks to the back on each side of the reindeer head to form the antlers. Glue the small craftsticks to the back side of the antlers to form the prongs. Glue on Wiggle eyes and pom pom or bead for the nose. Draw on a mouth with a thin black marker. Glue a small sprig of green garland with red pom poms or beads for the Christmas decoration. We actually scrunched up a glitter pipe cleaner because that is what we had on hand. Be creative. Form a loop with the cord and glue to the back of the reindeer head to hang as an ornament.